KANSAS CITY, Kan. — If you’re a parent of a child with special needs, you yearn for the day the Catholic faith will touch your child in a meaningful way. Several parents got to satisfy that emotion this summer with Totus Tuus. Totus Tuus is the Archdiocese of Kansas City in Kansas’ summer Catholic youth program dedicated to sharing the Gospel and promoting the Catholic faith through evangelization, catechesis, Christian witness and eucharistic worship. 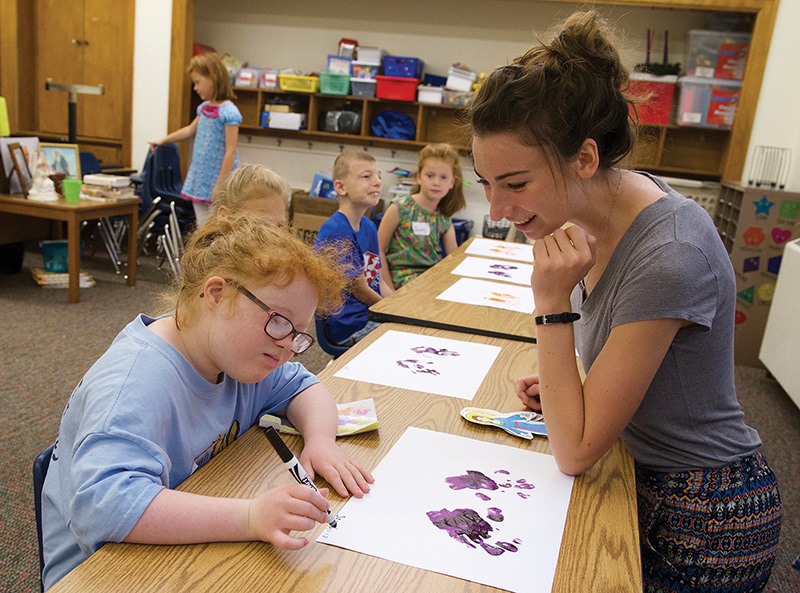 In July, the archdiocese hosted a four-day Totus Tuus camp designed especially for people with special needs. Cathy Siler, a parishioner of Old St. Patrick Oratory in Kansas City, Missouri, took her 10-year-old son Levi to Queen of the Holy Rosary Parish in Overland Park where the camp was held. Levi has a cognitive, fine motor and speech delay. It has impacted his ability to receive sacraments on time, as well as his understanding of the Catholic faith. “Most people see Levi and recognize that he has a disability. He doesn’t speak clearly, but he understands much more than they realize,” Siler said. Levi quickly acclimated himself to the four-day curriculum, which is based on different areas of Catholic education each summer. He even carried the cross for the processional and recessional at Mass each day. This year, Totus Tuus for children with special needs focused on the rosary and what’s in the church environment — from the pews and holy water font, to the Stations of the Cross, tabernacle, crucifix and candles. Tom Racunas is the lead consultant for the archdiocese’s special-needs ministry. He personally witnessed what he calls that “lightbulb moment” when Levi demonstrated he understood the lessons of the week. “I was in the classroom and we were studying the visitation of the Blessed Virgin Mary. We asked Levi to point to Mary and Elizabeth and he got them both,” said Racunas. A lack of inclusiveness in other settings is what prompted Siler to enroll Levi in Totus Tuus. But there was a time when the church struggled to make people with special needs feel included. “All means all,” said Racunas. “No one should be excluded. Thirty years ago, we didn’t know the teaching techniques or have the tools necessary to provide effective catechesis. Eleven-year-old Sarah Goddard attended Totus Tuus for children with special needs, too. Sarah has Down syndrome . . . and a fiercely spiritual side, her mother Maureen said. Sarah has received the sacraments of first Communion and reconciliation at her parish, Holy Cross in Overland Park. There, she attends religious education, which is based on the Catechesis of the Good Shepherd. A class teacher and aide help bring her lessons to life with visual aids, videos, arts and crafts, and more, much the way Totus Tuus did this summer. Totus Tuus for individuals with special needs serves a wide age group, from ages 6 to 61. Topics and teaching methods adapt to the age and learning style of each group. Racunas’ own brother struggled with significant learning disabilities, so he understands the sense of hope Totus Tuus gives parents. Racunas is currently working with an advisory council to prioritize possible initiatives that will further the inclusion of people with disabilities in all parishes in the archdiocese. We keep you in our daily prayers. May our Guardian Angels go with us on this pilgrim journey toward heaven.